The Amber Room was a tiny 11-foot-square jewel box with pannels crafted from amber, jasper, onyx and other semiprecious stones presented to Peter the Great the Russian Czar by the King of Prussia in 1716 as a symbol of their freindship. Afterwards Catherine the Great had a new generation of craftsmen expand on its existing beauty and by 1770 the room dazzled with gold, amber, mirrors and mosaics which all bathed in the warmth of over 500 candlelights. The original Amber Room was stolen at the German invasion of the Soviet Union during Word War II and has been missing ever since the war ended. But wait! Our very own Philip B. has been channeling “Indiana Jones” by spending time in the libraries of Berlin, researching and exploring the globe for the missing pieces of The Amber Room. His travels have led him to discover the ancient secrets of amber. He’s managed to capture inside a bottle, a formula which contains warmth and earthiness in its scent with a rich honey-esque texture resembling extracted resin. Like a genie in a bottle, once opened the aroma of the amber will begin to fill your bathroom with the opulent golden warmth of the fossil itself. This morning I turned my bathroom into the Amber Room when I decided to give Philip B® Russian Amber Imperial Shampoo and Conditioning Crème it’s fair chance at making an imprint on my hair washing history. The luxourious hair care combo is a perfect protector for colr-treated, damaged hair. You’ll find, as I did, that a little goes a long way with this resin thick shampoo..a pinch will do. In fact, I call it the amber pinch. Massage it into wet hair with your fingertips, and be amazed as the shampoo lathers, adding instant softness, leaving your hair bouncing with health and vibrancy. All the while filling your bathroom with a beautiful exotic aroma. Rinse well and then enhance your treatment even further with Philip B. Russian Amber Imperial Conditioning Creme. This ultra-nourishing complex blends heavy-duty doses of healing L-Amino Acids with a Romanov-inspired blend of pure plant botanicals, including a touch of tantilizing Amber Oil. I like to comb it through and let the conditioning properties sink in before rinsing so that my hair is tangle free. The award winning potent and luxurious haircare combo will show a dramatic, noticeable improvment to all hair types. Once agian Philip B. – The Thompson Team thanks you for adding beauty to our lives. 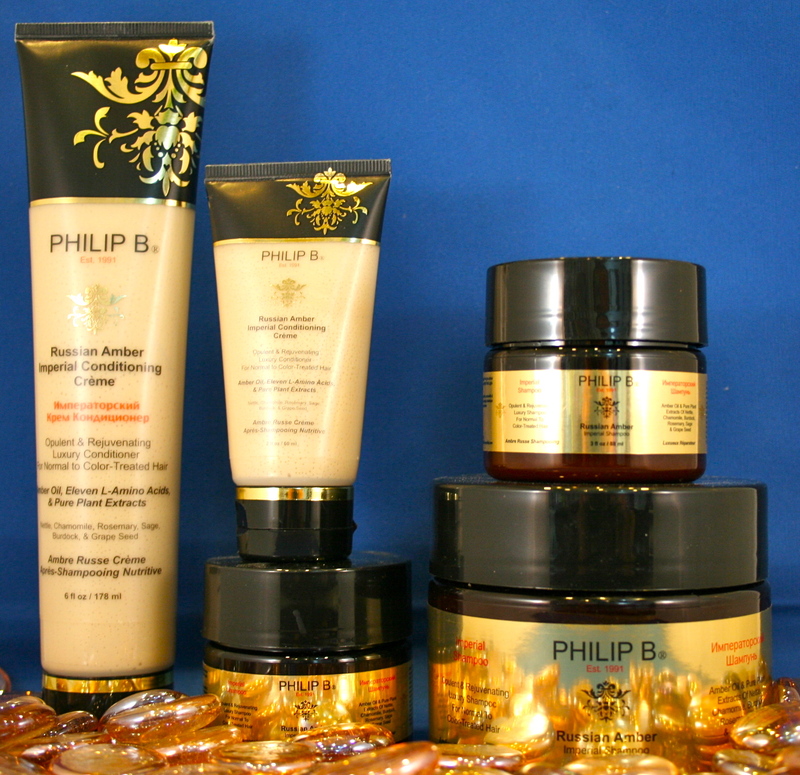 Great Russian Amber Products from Philip B.
Reconstructing shampoo rejuvenates and revitalizes all hair types, giving even chemically-damaged strands a dramatically youthful look, feel and radiance from the first use. The power-packed formula truly heals on all fronts: Eleven life-giving L-Amino acids at active strengths repair hair on a cellular level — quickly restoring its body, bounce and shine. An extraordinarily high dose of Panthenol (Vitamin B5) coupled with a catalyst, Phytantriol, sinks moisture deep into every strand. An artful, Russian-inspired blend of Chamomile, Grape Seed, Rosemary, Nettle, Burdock and Sage infuses hair with emollients for a healthy gleam-from-within. Protective Silk, Wheat and Soy Proteins increase elasticity and tensile strength. 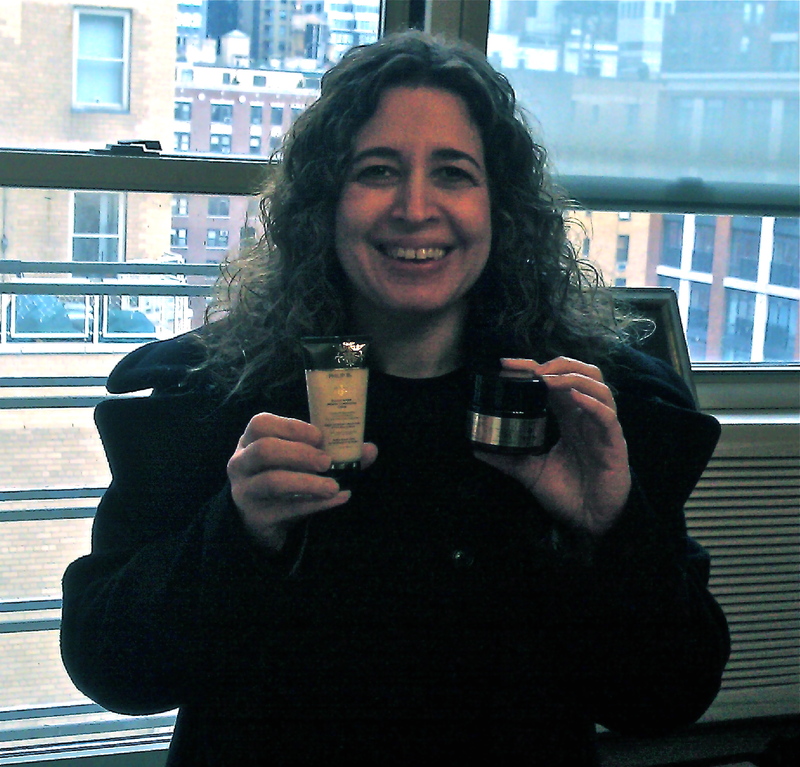 And Shea Butter imparts a finishing touch of weightless hydration for beautiful, long-lasting bounce and resilience.